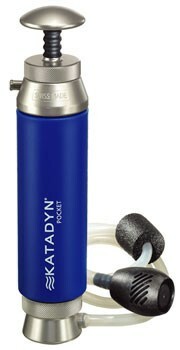 Katadyn Pocket Water Filter. Complete set includes the microfilter housing with round pump handle and improved output spout, 1 ceramic micro filter cartridge, input hose with modular pre-filter , output hose with universal bottle clip, silicone lubricant, a measuring gauge to determine when filter needs replacement, deluxe carrying bag, instructions and field tips, 2 cleaning pads and a hydration system connector. BACTERIA, including Staphylococcus aurens, CLostridium perfringens, Campylobacter, Salmonella, Shigella and E. coli. 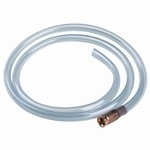 Pump body: 8.0" X 2.3"
Handle : 2.0" X 0.8"